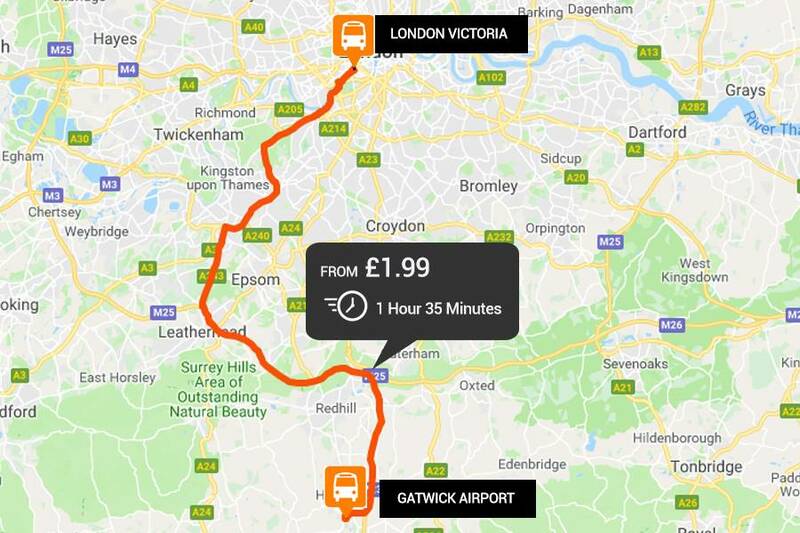 easyBus, in partnership with National Express offers an airport transfer bus service between the South Terminal of Gatwick Airport and London Victoria coach station from only £1.99 one-way when you book in advance. The journey time is between 1 hour 25 minutes and 1 hour 35 minutes. Please Note: The Gatwick Airport to Central London via Victoria Station bus transfer route is operated by National Express. Pick-up and Drop off Location details can be found on your ticket. When embarking from Gatwick airport, look out for the National Express coach A3 or O25, at Stop 3 of Lower Forecourt at Gatwick Airport South Terminal. Exit Stockwell Underground station and Head northeast on Clapham Road (A3) toward Binfield Road. Keep to the left and continue onto South Lambeth Road (A203/A3). Both Bus stops are located in-front of you. Exit Vauxhall Underground Tube Station and turn left towards Bondway, then continue onto BondWay. Turn left onto Parry Street (A3036) and then turn right onto South Lambeth Road (A203). Both Bus stops are located in front of you. Exit Streatham Train Station and head north on Streatham High Rd (A23) toward Station Approach. Bus stop O will be located on the left. Cross the road directly across from Bus Stop O to arrive at Bus Stop NA. The journey is approximately an 11 minute walk. Victoria Train & Tube Station is a short walk from the Victoria Coach Stations Pick-up and Drop-off points and offers variety of services including clothing retailers, restaurants and coffee shops. Travellers can connect with the Southern, Southeastern and Thameslink National Rail trains to a host of stations inside and outside of the capital. Easy access to the London Underground tube network via the Circle, District and Victoria lines provides quick access to all of London.